In 2007, the Mayor’s Aquatics Task Force worked with Counsilman-Hunsaker to develop strategies to meet the community’s future needs. Being responsive to the consensus position of youth and adults who participated in the demand assessment process for a higher quality pool system, the Aquatics Task Force recommended a Four Facility Master Plan. This plan was later approved and construction began in 2008. 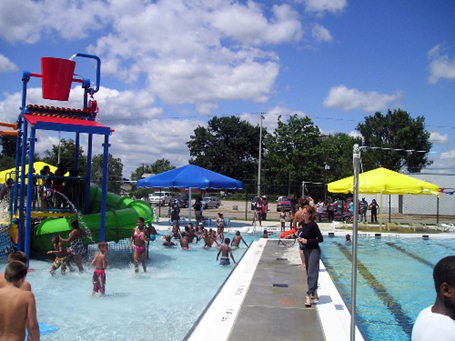 Two identical neighborhood outdoor pools have been completed and opened for the 2009 season: the Norman Mosby Pool at Howell Park (8,825 sq. ft.) and the Rochelle/Landers Pool at Bellemeade Park (8,230 sq. ft.). The pools have several sustainability features built into their design that include ultraviolet systems, high efficiency pumps and motors for pool equipment, high efficiency plumbing fixtures, and recycling of pool backwash water.